One of the best things about going to Disney World is the food! I know not everyone likes the food [overpriced, nothing special], but I enjoyed it. The prices were a bit crazy, but you aren't just paying for the food, you are paying for the experience and, of course, the opportunity to meet a lot of characters in a short amount of time without standing in a lot of lines. Each meal was carefully choreographed so that each character visited each table and spent a few minutes. Even Maggie, who stated she didn't care about meeting the princesses, had fun and jumped up for pictures! We ended up with four character meals, though I'm not sure I would count the meal at Beast's Castle as we only met him after the meal. Our original plan had only one princess meal: at Cinderella's Castle on Jessie's birthday, because, well, Jessie! We had made reservations at 'Ohana, but as I was looking at details, our meal there was an evening meal and they didn't have the Lilo & Stitch characters there. When there wasn't a breakfast available there, I looked for other options. I did check with Maggie to be sure she would be okay with 2 princess meals. I was able to make these reservations via the My Disney Experience App. We had Saturday breakfast at Akershus Royal Banquet Hall. This was our first opportunity to meet the princesses. We got there early so ended up spending time hanging around the area waiting. If you have a reservation, you are able to get into the park early, but the only benefit is really for pictures and we headed straight for the banquet hall. The girls enjoyed watching a squirrel attempt to steal someone's baggie of trail mix they had left in their stroller. I wish I had been able to get an earlier reservation so we could have taken a few minutes afterwards to get a family picture with Mickey Mouse -- next time! We were greeted by Belle [and this ended up being the only time we met Belle] and got a nice picture of the girls with her. The meal here was a buffet of continental breakfast items with a few Norwegian choices and the wait staff brought a "hot plate" to our table, which included scrambled eggs, cheesy hash browns [YAY! ], bacon and sausage. And of course, the drinks of your choice. The food was good and I enjoyed trying some of the Norwegian options [cheese & meat]. Jessie was very excited to see Cinderella, who was the first princess to come to our table. We brought a photo mat for these princesses to sign, so it was nice to not have to carry around both autograph books this day, especially as we were headed to a water park after this! 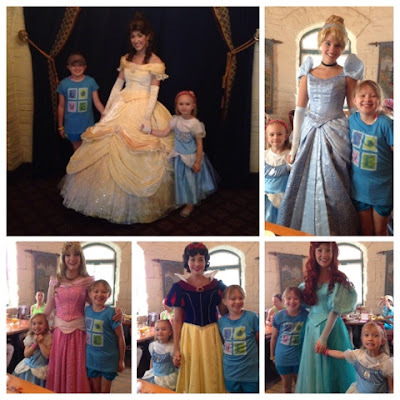 Jessie was still a little shy around the princesses, but jumped up faster than when we met Mickey & the gang. We also got to meet Aurora, Snow White & Ariel. They had a little princess parade where the kids followed the princesses through the castle, and Maggie gamely went with Jessie. 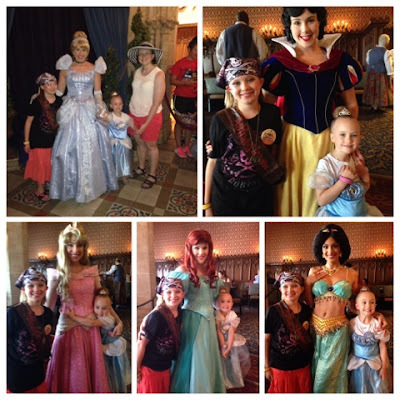 The princesses were all very personable and very much in character. Ariel was my favorite, she was the most animated and even commented on my red hair! Jessie got a card signed by all the princesses and a cupcake with candle for her birthday. This was a fun experience. The castle was neat [though not from any particular movie] with lots of "period" decorations -- thick, wavy glass in the windows that both girls commented on and lots of banners overhead. I think we all liked the food, but it was typical breakfast food. Cinderella's Royal Table was the 2nd birthday event for Jessie [first was the Bibbiti-Bobbidi-Boutique and third was meeting Elsa & Anna]. This was one I had asked the travel agent specifically for. In my research, I assumed we would end up seeing the same princesses as before, and mostly did. But eating right in Cinderella's Castle? it is definitely worth it. Plus, we had a princess and a pirate to dine with! This meal started with an appetizer of hummus and a spinach salad while the girls were brought grapes and cheese. I chose the braised short ribs for my meal with mashed parsnips & potatoes. While we ate, the carefully choreographed dance of the princesses visit went on. Here the princesses were announced with a little back story [as if that was needed!] and instead of Belle, we met Jasmine. Aurora was the most playful here [covering Rocky's eyes when she got to our table & earning the title of Rocky's girlfriend the rest of the day] though Snow White had to check to see if Pirate Maggie gave the pirate at another table a black eye [thus earning her place as Maggie's favorite, at least for the day!]. 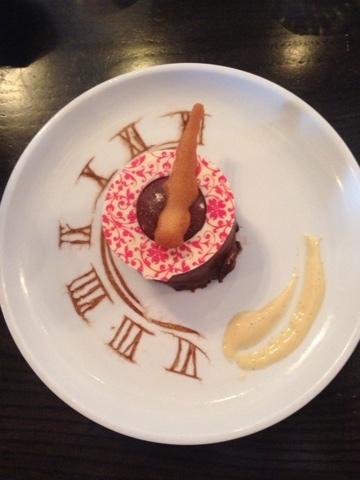 Dessert was also included. The girls had ice cream and Rocky had cheesecake. I chose the special (below) "The clock strikes twelve": white chocolate mousse covered in a dark chocolate. This was the only pre-planned meal that didn't bring Jessie a card & candle in her dessert -- which she didn't even notice. I liked that they acknowledged her birthday, but it wasn't too over-the-top as to be annoying to Maggie. I think she got a little jealous by the end but handled it very well. Overall, both meals are definitely worth it. Keep in mind, you aren't just paying for food, but for the opportunity to meet a lot of characters in a short amount of time with no lines. I would definitely do one or both again, but next time I would chose different meal. I do wish they had more princess rotations: Tiana, Rapunzel, Anna , Elsa, Merida, Mulan; plenty to choose from! We ended up meeting Ariel 3 times on this trip [we had to meet her in her grotto where she's a mermaid] and missed Tiana, Rapunzel & Mulan as we were tired of waiting in lines.